The last couple of months have seen us working on a number of projects for existing clients, including some interesting mobile work, as well as launching some of our best work to date. 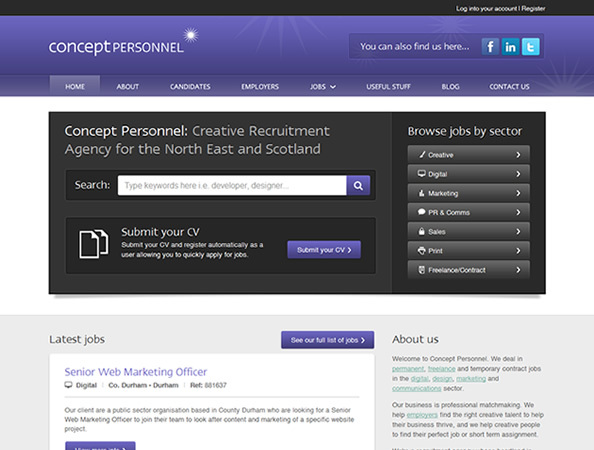 You can read a little more about the new Concept Personnel website in our blog post from earlier this month. We have thoroughly enjoyed working with the team over at Concept, and we believe both the desktop and mobile versions of the website fit the brand perfectly. Visit the new Concept Personnel website. The last couple of months has seen us launch a number of exciting features in the VLS customer area that will help the staff of Northumbrian Water to track fuel usage across an entire fleet of vehicles including price, location and vehicle information, as well as a new system that will allow VLS to manage their annual vehicle replacement cycle. VLS have also recently moved offices, which you can read about here. On the back of this office move, we will be updating the website with some new content and some changes to the design. We are well into the design stage for this project, and we are excited to launch what we believe will be a sector leading website. Keep an eye out for some visuals on the blog soon. We are helping neighbours Lock N Store launch a new website to fall in line with some brand updates from our sister company Projector. We will be developing the website responsively so that it presents content tailored to each device (desktop, tablet or mobile handset). We are excited to be using a local company to showcase this exciting technology. Work has begun on the planning stage for a mobile version of the Parkdean sales website. Fitting the holiday booking process onto a small screen is a challenge we look forward to facing, and it gives us a great opportunity to play around with some interesting navigation options. 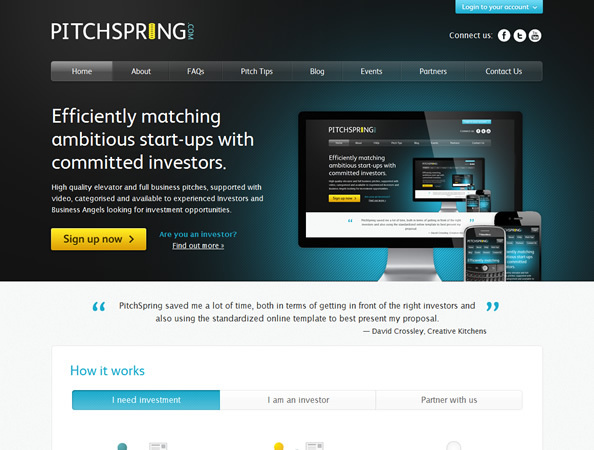 We will be launching the new version of www.pitchspring.com very soon. This is another project where we have been developing the desktop and mobile versions side by side, and we are confident users will see a big improvement in usability when the project goes live towards the end of June. We are continuing to work on the very first mobile website for Sanderson Young and are making good progress through the wireframe and design stages. We are confident that when the website launches, it will be a big hit with users. We were recently commissioned by Airowear to develop a new website for the business. One of the UK’s leading designers and manufacturers of equestrian body protectors, we are working to design and develop a new online presence to raise their profile and improve engagement with customers and stockists internationally. More updates on the project in future updates. Our latest project with beacon is the design and development of an online professional services directory for the business. A leading procurement specialist for the hospitality industry, beacon’s new online directory will strengthen their relationships with customers by offering unique discounts with a range of professional service businesses. We’re working with the award winning Heaton Property on a brand new website. The Newcastle based lettings specialist were recently awarded the Sunday Times Letting Agency of the Year 2012, and deliver a range of unique initiatives for their tenants and landlords. We’ve worked closely with their team to design a site that reflects the ethos and personality of the business, the website will be launching in early July, more on this next month. We’re about to launch a new website for Derwent Lift Services, the leading independent lift supplier in the north east. The company work in partnership with architects and builders on everything from standard requirements to bespoke developments across the UK. Their new website promotes the range of services that they provide and the specialist advice and experience that they can offer. The Gateshead Collective is a unique collaaboration, the first of its kind, between Gateshead-based training and education providers working together to develop and deliver high quality and wide-ranging skills development solutions to individuals and businesses located in Gateshead. We have been working on a brand new website for the organisation, promoting the range of services and support they provide, using the new brand identity created by our friends at Projector. Due to launch in July, look out for future updates on this project.